A blaze erupted at the Daewoo Shipbuilding & Marine Engineering’s yard in Okpo, South Korea on Monday, killing two workers and injuring seven others. The fire started during welding work on a very large gas carrier (VLGC) that is under construction at the yard. The welding work may have set off a gas explosion in the inner compartment of the vessel, Maritime News said. One unnamed 39-year-old worker was found deceased in a fuel tank of a 84,000 ton liquefied petroleum gas carrier around 5 p.m. local time on Monday, Offshore Engineer said. The body of another unnamed 30-year-old worker was discovered soon after. 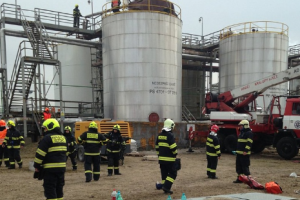 Forty-seven people were working on the VLGC when the blaze broke out and seven have been hospitalized for fume inhalation, Offshore Engineer added.